Recently we read about a teacher in Aiken, SC taking her students out to Aiken County Open Land Trust Carolina Bay to do some water testing and take a walk through Nature. All of us here at Water Testing Blog enjoy hearing about schoolteachers who take students out on field trips and teach them about water quality issues. In our opinion, showing children firsthand that the stuff (science) they learn in the classroom has applications outside of the classroom helps them retain more knowledge than they would if they just learned something for the sake of passing a test. It had rained most of the night and early Friday morning, but Millbrook Elementary School fourth-graders eagerly arrived at Aiken County Open Land Trust Carolina Bay, ready to collect data. As always, teacher Karey Santos was holding court on water quality. She gave one student a test strip to determine pH, the water’s acidity. He seemed ready to plunge right into Carolina Bay. Teaching children about simple things like pH, hardness, alkalinity, tds, etc. and giving them an opportunity to test for each of those things in a real world setting adds a level of excitement to the topics and creates a greater understanding of their importance. 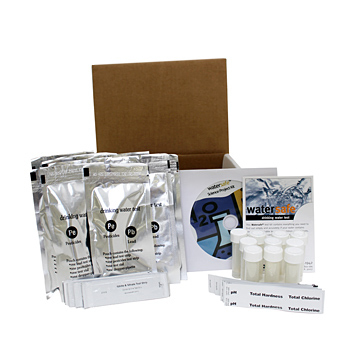 The WaterSafe Science Project Kit 10-pack allows users to analyze up to 10 different water sources and compare the results of all tests within a matter of minutes. Alternatively, the kit could also allow up to 10 students to analyze the same water and then compare results. 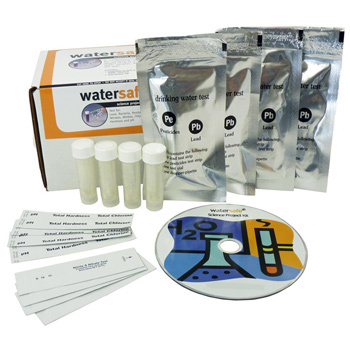 WaterSafe Science Project Kit includes tests for Lead, Bacteria, Pesticides, Nitrates, Chlorine, Hardness and pH. WaterSafe knows that urity of water has far reaching real life significance to us all and designed their WaterSafe Science Project Kit for use in classrooms, on field trips, and for use as science fair and school projects. They provide a structured learning experience and at the same time give students opportunity for individual thought and innovation. Younger students can learn from their experiences using WaterSafe Science Project Kits because of their simplified testing methods and older students can incorporate the kits’ water testing methods into other, more sophisticated water quality investigative work.